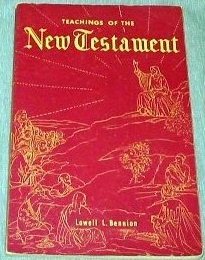 A few months ago I purchased and slowly read Teachings of the New Testament, written by Lowell Bennion and used in the adult Sunday School in 1953. Brother Bennion was Director of the Institute of Religion in Salt Lake City when he wrote the manual. There are 44 chapters, or lessons, in the manual designed to "bring out the moral and religious implications of New Testament teachings for our times." Our time is not their time, but the fundamental principles taught by our Savior are timeless in their application. Here is the first of four lists in the manual I found interesting, uplifting and easy to replicate in post form. Why study the New Testament? 1. 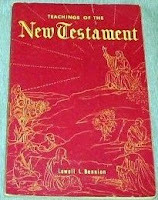 The New Testament is varied and rich in content. It abounds in human interest material, in insight into ancient life and culture, in beautiful literary expression, and in interesting and inspiring moral, religious and theological teaching. One may read the book again and again and neither exhaust nor retain its full meaning. 2. A second reason to study the New Testament again is that we change from year to year. Life is dynamic. We live through periods of storm and stress, joy and sorrow, success and failure, peace and war, fear and hope. New questions arise in our minds. We look at life with new fears and with new affirmations. Things happen to us. We marry, bear children and rear them. We become grandparents. Our sons go to war. We enter business, buy and sell. A man cheats us, or, in a moment of weakness, we may cheat someone else. We build a house and move into a new neighborhood. Television enters the house. A different political party comes into power. We take a new job in the Church. All of these things give us a new outlook, raise questions and provoke in us the need for a substantial faith and a means of recognizing good and evil. 3. A third reason to return to the New Testament is that it is our richest source book on the life and ministry of the Lord Jesus Christ. Too little study is given by us to the life and teachings of the Savior. We belong to his Church. We profess as our first principle of religion "faith in the Lord Jesus Christ." In the maze and haste of contemporary life, even including Church activity, we need to return more frequently and leisurely to the fountain of our faith, even to the Lord Jesus Christ. We need to ask ourselves questions like these: Because of our faith in Christ, in what do we have faith? What do we do in daily life because of our faith in him? What things were of greatest worth to Christ? What things are of greatest worth to us?